Each work day morning I usually commute to downtown on MetroRail. Along the way, there is a stop at the Tri-Rail station, where commuters from Broward County board our train. Tri-Rail is a heavily subsidized, public commuter train company that rents track time for its cars from CSX. Tri-Rail's route runs parallel to I-95, beginning in north Palm Beach County and running south to its termination at a station near MIA airport. Its train stops at the MetroRail transfer point where its commuters join my ride. These government workers exit at two stations downtown and they walk all of about 100 feet to government buildings built immediately adjacent to the MetroRail stations. Do you think that county government had a hand in designing MetroRail? None of those buildings, built as they are on prime downtown property (or what could have been prime downtown property), pay any taxes, of course. They are built to absorb taxes, which they do well. Several years ago the people of Miami-Dade County in a referendum passed a one-half cent additional sales tax. We were promised that the funds would help with needed capital improvements and address deferred maintenance for MetroRail. The Miami Herald could not stop writing about what a wonderful thing such a tax would be. All the politicians supported it. It passed. But the funds were not used for capital improvements for MetroRail. Instead, they were used to raise salaries of the government workers who are employed by MetroRail. Even the Herald had to admit that Metro-Dade broke its promises and we were had. 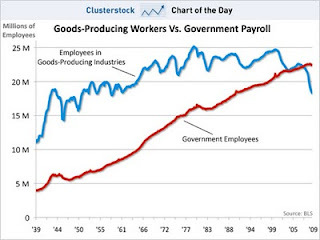 Of course, we need some government workers, and many of them are conscientious and competent people. (Some of my best friends are . . . etc.) But they will be hurt along with the rest of us when our society collapses because of radical government expansion.